Save hundreds on your shop! 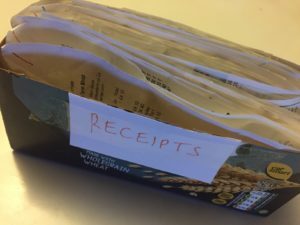 Sharing this one with you as I only found out about it the other day so I’m trying it out myself after reading many other blogs saying you can save hundreds on your supermarket shop throughout the year. Is this really true methinks – so let’s try it. I’m trying various money saving ventures at the moment including using supermarket apps, growing my own food, blogging, budgeting and more. If you sign up for my newsletter I will keep you up to date as I discover new ways to save money and make extra cash. So this latest find…well it’s called ‘Wombling’ and I’d genuinely never heard of it but in just one week I’ve already saved a few pounds off my next grocery shop. If you’re too young to know what the Wombles are – they were a kids TV show back in the day and they were the original recyclers I guess! They picked up stuff other people threw away and made good use of it. Being a womble in 2018 means finding receipts other people have thrown away and claiming the points if they haven’t already been claimed. So what I’m doing is basically just checking the trolley park area when I collect then put away my trolley for discarded receipts. Then next time I’m shopping, I pop to customer services and ask for them to be added to my points card. This then bumps up my points giving me free food basically! The more I save on groceries, the closer I get to owning my own home! It does involve a little research like knowing that you only have 14 days to claim points from a receipt at Sainsbury’s and Tesco but 30 days at Morrison’s for example. I think there’s a limit on how many receipts you can add like up to 15 receipts a month at Morrison’s. And just double check the points have not already been claimed – so it needs to say something like “Today you could have earned 50 more points”. A word of warning though, as although Wombling is completely legal, some supermarkets aren’t keen so be discreet. Best to not obtain receipts in store and don’t go rummaging in the bins. Stick to what’s on the ground, in trolleys and baskets and generally blowing around in the wind. What’s that saying…. ‘where’s there’s muck there’s brass’ ! There is also a way you can make money on the price guarantee offers supermarkets give – Holly Vlogs has a great video about this. Good luck and let me know how you get on by adding a comment below. Righteo….I’m off to Sainsbury’s….! Don’t forget to subscribe to my newsletter and you’ll be the first to know about new ways to save. If you’re looking for more money saving and cash creating ideas – join the friendly Super Savvy Vegan Facebook group. I’m also on twitter and Instagram. Previous post: New Vegan Chippy in Exeter! Thanks for your lovely comment Lisamarie – it’s quite a long term goal but I’m closer than I was a few months ago when I would have thought it impossible to save even one penny! And yes 6 years vegan and although I don’t think it’s particularly useful to have regrets in life – yeah, I wish I’d gone vegan sooner, it’s so much easier than I thought it would be. Wow, I’ve never thought of this. Such a creative idea! Good tip. My problem is that I forget to take my card with me and I don’t get the points – and then forget to add points within the allowed timescale. Every penny counts so I ought to. For the same reason we’ve swapped a credit card to a supermarked linked one – every purchase earns us points to use elsewhere. Thanks. Do you have the points fobs on your keys? That’s one way to get round forgetting your cards.